Overall print size: approx: 24” x 14.5” / 61 x 37 cm. The last of the famous delta-winged V bombers, the Vulcan was introduced to provide Britain with an effective nuclear deterrent during the Cold War. Moving into a conventional arms role the Vulcan was blooded in 1982 during the Falklands War. Finally it was employed as part of Strike Command’s air refueling tanker fleet; completing nearly three decades of exceptional service. XH558 was the first Vulcan B.2 to be delivered to the RAF and was the last to retire from service. It went on to thrill spectators for several years at air displays. For the last few years it has been the subject of massive restoration project which has finally succeeded in getting it flying again. 62 ops as Flight Engineer on Lancasters of 156 Pathfinder Squadron. 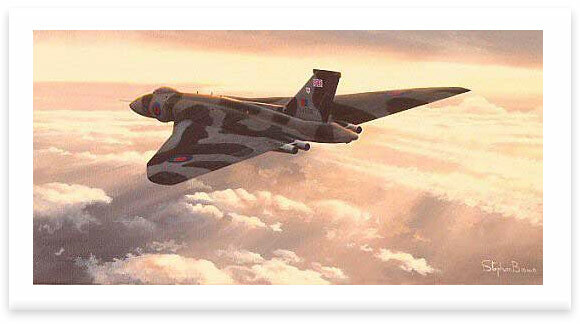 After the war he qualified as a pilot and flew all three types of V-Bomber operationally including Vulcan XH558. He flew the mission that dropped the third and last Atom Bomb on Christmas Island.